Overfeeding goldfish can cause major problems for your pet. Unfortunately, it's extremely easy to overfeed a goldfish. Any excess food in the aquarium can cause serious problems. Following strict guidelines can help prevent this problem. Always remember that it's easier to overfeed a goldfish than to underfeed it. Use a flake food or pellet food as the main staple for your fish. You can also provide the occasional live or frozen treat like brine shrimp or bloodworms. Many pet shops sell these items. Goldfish do fine with one or two small feedings a day. To estimate the amount of food to feed, remember that a goldfish's stomach is about the same size as its eye. Watch for signs that you're overfeeding your goldfish. If your goldfish cannot eat all of its food in three to five minutes, you've given it too much. You'll also see excessive food accumulating in the substrate, where food will break down into a brownish-gray or blackish substance called mulm. 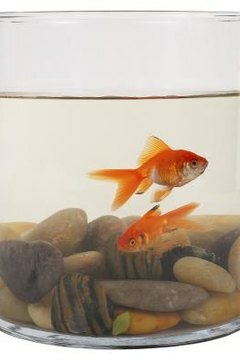 Goldfish will rarely eat food once it has fallen to the bottom of the tank. Believe it or not, the problem with overfeeding is not damage from overeating. If there's too much food in the tank, a goldfish will most likely not be able to eat it all. Most of the damage from overfeeding comes from food rotting in the aquarium. Rotting fish food produces ammonia, which is toxic to goldfish. In the case of goldfish in outdoor ponds, don't feed them once the temperature drops below 50 degrees Fahrenheit. In this case, extra food inside the goldfish's tummies can cause problems once they begin to hibernate. A few guidelines can help prevent overfeeding. Only have one person feed the fish to prevent confusion over when the fish ate last. Also, pour food into the lid of the fish food container before dumping it in the tank. This way, if you spill it, the excess won't fall into the tank. Observe the fish when you feed them. If they eat all of the food in a few minutes, you're providing the right amount.